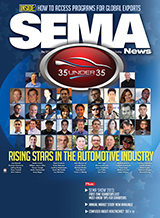 Looking to the future SEMA News  editors asked the industry to help identify 35 people age 35 and younger who were already making an impressive mark on the specialty-equipment industry and taking it in exciting new directions. The article drew a lot of attention and praise from aftermarket newcomers and veterans alike—so much so that nominations immediately began flowing in for a second year’s class of young go-getters. In the following pages, we are pleased to present a fresh slate of 35 honorees for 2013. Located in La Habra, California, the company was co-founded in 2004 by CEO Mike Brown, then 19, and President Ron Hay, then 24. Their original business plan called for a sort of online clearinghouse of special automotive parts promotions and deals similar to those offered by tech-industry bargain sites. But the venture quickly morphed into something much bigger—and better. The “Affordable Care Act” continues to sow confusion for many SEMA members. To follow is a concise summary of the law’s key provisions and timetables for implementation. Top Five Reasons to Get Started Now! Yep, the Internet has changed the way we do business as well. So what’s the common thread that is replacing the long-standing virtues of face-to-face business, customer relationships and loyalty? If you ask me, it’s technology. Each year, SEMA commissions an internal study to help association staff understand how to make the SEMA Show better. Based on thousands of interviews with exhibitors and attendees, it’s a study that contains valuable insights about the SEMA Show for the association. Of those insights, perhaps the most valuable takeaway is that new products are the force that drive the Show, yet many exhibitors don’t utilize successful Show features that highlight their products. Our surveys tell us that 87% of buyers consider new products their number-one priority when the Show opens. Not surprisingly then, we see that roughly three-quarters of buyers visit the New Product Showcase at some point during the Show. The SEMA Show is the world’s most valuable automotive specialty-equipment trade show. More than 2,100 companies have already secured space for the 2013 event, including more than 415 first-time exhibitors. And while the information provided here is particularly urgent for those who are new to the SEMA Show, it is also must-know content for all exhibiting manufacturers. More than 130,000 industry professionals are expected at the Show, which is open only to those individuals who are employed in the automotive industry. It is designed to provide manufacturers of automotive products and accessories with a venue to connect and do business with buyers from throughout the world, so the better informed exhibitors are, the more successful their experience will be. The Vehicle Technology Center (VTC) held a prominent position in the Grand Lobby of the Las Vegas Convention Center at the 2012 SEMA Show, drawing greater attention and attendance than ever before. The VTC and Technology Briefing Seminar (TBS) program will be returning to the 2013 SEMA Show, providing attendees with new levels of education through the program’s vehicle technology keynotes, briefing sessions and workshops. The association’s vehicle technology programs, initiatives and relationships are investments in SEMA’s collective future. The purpose of the VTC and the accompanying TBS program is to inform SEMA members about the latest vehicle technologies and introduce them to the programs, resources, partners, solutions and benefits available to them at affordable costs as well as show them how to protect their businesses in the face of disruptive and advanced technological change. Advanced vehicle technologies are integral to both the relevance and the future of SEMA. To ignore their impact is a fundamental mistake. Disruptive technologies don’t totally eliminate existing vehicle technologies, but they do often eliminate unprepared businesses and companies. According to Show Management, the total number of first-time exhibitors at the 2013 SEMA Show (as of July 12) was already 417 and continuing to rise. With exhibitor registrations stronger than ever, buyers attending this year’s Show will have an unprecedented opportunity to connect with hundreds of new manufacturers and suppliers. Registration is now open for the 2013 SEMA Show, Tuesday–Friday, November 5–8. Attendees, as well as the media, are invited to register for the annual Show online (www.SEMAShow.com ). Members of Congress stand for re-election every two years, which often leads to quick turnover among the 435 seats in the U.S. House of Representatives. In upstate New York near Buffalo, voters recently elected a new legislator with a career in small-business growth and development. Given this background, Rep. Chris Collins (R-NY) was thrilled to visit JR Products and showed interest in learning how SEMA-member companies contribute to the local economy. Rep. Collins was elected to the House of Representatives in 2012 to represent New York’s 27th Congressional District. From 2008–2012, Rep. Collins served as Erie County Executive, having spent the previous 34 years as a business owner and entrepreneur. A mechanical engineer by training, Collins began his professional career with Westinghouse Electric. He was subsequently the president and CEO of Nuttall Gear Corp. in Niagara Falls, New York, a company that specializes in power transmissions for heavy-duty machinery. Breaking news from SEMA members, including Wes-Coast Marketing, Yokohama Tire, Betts, MGP LLC and more. The SEMA Education Institute (SEI) has developed a three-part series of webinars designed to help exhibitors—both first-timers and veterans—get the most out of their SEMA Show investments. Preparing for the Show is a tremendous task, and strategy is required to successfully navigate the logistical and operational aspects involved. The first two sessions in the series covered such topics as pre-Show marketing and provided insight on proven ways to drive booth traffic, tactics for getting exposure and attention at the Show and how to eliminate costly exhibitor mistakes. Both sessions are available for SEMA members to view free of charge. The U.S. Senate Resolution recognized “that the collection and restoration of historic and classic cars is an important part of preserving the technological achievements and cultural heritage of the United States.” Lawmakers in states, counties and local areas all over the country and Canada followed the Senate’s lead. The states of New York and New Mexico as well as the Canadian provinces of Manitoba and Nova Scotia adopted their own resolutions commemorating the day. Nissan Aftermarket Engineering has launched a program of services to SEMA manufacturer members (only) for the automaker’s vehicles sold in the United States. Available through SEMA’s existing Technology Transfer program, the program is intended to provide members with access to Nissan’s technical/BBG questions, CAD files, aftermarket product notifications, white bodies and modifier VPPs as well as Ship-Thru and Ship-To services. To help facilitate incoming calls and e-mails, Nissan is launching a toll-free phone number and e-mail address. The phone number is 855-651-6655. The e-mail address is Nissan-AET@nissan-usa.com . Phone messages or e-mails will be replied to within 24 hours or the next business day. To help attendees at the 2013 SEMA Show obtain low-cost hotel rooms and support throughout the entire housing process, SEMA has partnered with Travel Planners—the official housing service for the 2013 SEMA Show. Travel Planners provides Showgoers with its Lowest Rate Assurance, meaning that the company negotiates lowest-rate guarantees into all of its hotel contracts and then works with hotels to meet or beat the reduced rate and pass the savings on to attendees. Even if reservations are set, the rate will be lowered automatically and the savings will be confirmed by e-mail. All attendees and exhibitors have to do if they find a lower rate is contact Travel Planners. As long as the rate is for all of the dates of the stay, Travel Planners will get a price that is as good or better. E-mail marketers operating without significant, robust accommodations for mobile device users are leaving trunks of money at the table, according to two new reports on e-mail usage. A full 41% of all e-mail is now read on mobile devices—smartphones and tablets—and that’s a spike in preference that will continue to rise for the foreseeable future, according to the “Mobile E-Mail Opens Report, 2nd Half 2012,” released by Knotice, a marketing firm. SEMA has a long history of monitoring federal and state legislative topics that are of interest to the automotive industry as well as the association’s member companies and their customers. One key topic of current concern is the Renewable Fuel Standard (RFS)—a law that requires annual increases in the amount of ethanol to be added to gasoline. The SEMA Action Network (SAN) recently helped organize antique-car owners and motorcyclists from all over the country to participate in a “Fuel for Thought” rally on Capitol Hill in opposition to the RFS. This issue is important to automotive enthusiasts because ethanol’s chemical properties pose a risk to older cars and motorcycles. Ethanol absorbs water, which can lead to metal corrosion. It can also dissolve certain rubbers and plastics. Most older vehicles and many motorcycles are not constructed with ethanol-compatible materials.